The stage race consists of a 2.5 mi uphill time trial (TT) followed by a 46 mi road race (RR) on Saturday and a short, punchy 25 min crit on Sunday. My goal for this year was to improve my time in the TT and try to win the RR and crit. Whatever the overall results were after those efforts, that would be it. I still love TT’s – not! Unlike last year, I visited the course the night before and reminded myself of where the road pitches upward as well as where it relaxes a bit, which is also at a nice spot for a look into the valley. Yeah, I like the sight-seeing stuff – I admit to getting distracted. At least this year I wasn’t as freaked out as last year, but maybe that comfort was my undoing? The JM organizers have a cool email setup where they emailed us overall results within minutes of everyone finishing. Definitely raising the bar for other races (hint! hint!). I did not improve upon last year’s time, but I felt good and was sitting in 3rd place. The road race is a mountainous 46 miles. Ok, not mountainous – maybe not even considered hilly by some of the Colorado racers at JM. But I am from Chicago and these rises were higher than our highway overpasses, so they were worthy of special attention. The competition this year was also mountainous. Last year’s winner brought some powerhouse teammates. And there were other multi-member teams lined up for the master’s age group – and some had teammates in the W3/4 race which were racing with us. So the hills, the racers – all set for fun! I call the RR course a lollipop – you go out on the stick, loop around, and come back on the stick. So out we go, all together on the stick. Left turn onto the lolly and we start hitting the hills. First few were fine as I stuck with the break. Then I decided to play a different game – yo-yo, and not off the front. It was fun for a while until my yo-yo got stuck on the bottom of the string with about 10k to go. Remember how you would bounce the yo-yo to try to get it to roll back up while it was seeming to want to stay dormant at the end of the string – but then, yes, it would pop back to life? My yo-yo popped back to life as a chase group came by. We were only a few hundred meters behind the lead group. Yee-haw! We quickly reintegrated with the lead pack – springing them to life. They seemed to be out for a Sunday stroll. Suddenly it was Monday and they snapped back to work mode when they realized the group flying by was their competition. I don’t know exactly what happened at the finish line since I wasn’t there to see it. My yo-yo broke in the final kms and I came across 8th, 2 min behind the pack. There was a horrible crash after the racers crossed the line. Unfortunately it took out a few competitors, including the top-ranked Chicago racer in the W3/4′s, Psi-Met’s Kelli Richter. She was looking strong and relaxed throughout the road race and had a top-3 TT time. She would have been on the podium for sure – next time! 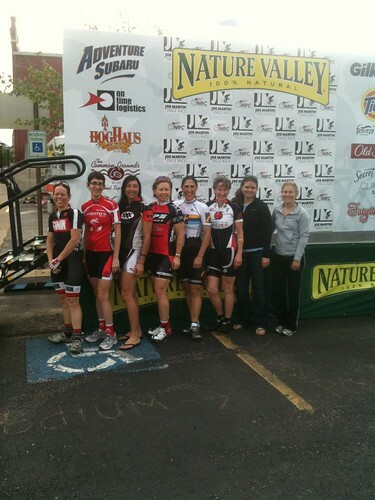 The Sunday morning crit started at 8:20 am – darn early for a 25 min crit. After a couple of laps of the course, I realized the bike wasn’t shifting very well between the large and small chainring – a move critical for this course. I stopped by the SRAM tent. I wish I got the guy’s name because he did a great job getting my bike back into shape. Once the race started, the pack rolled around as if in a dance. We all stood on the uphill, upshifted on the flats, lined up single file for the downhill, then all-together downshifted when turning onto the final stretch of road before again standing for the uphill. Repetitive and rhythmic. At the finish stretch, it was like I was in a trance and forgot to make a move for the win. I finished 5th. So an overall finish in 6th with the podium to 5 wrapped up this year’s version of Joe Martin. Gentle breeze… but a storm is brewing. This entry was posted on Tuesday, May 1st, 2012 at 8:29 pm	and is filed under Racing. You can follow any responses to this entry through the RSS 2.0 feed. Both comments and pings are currently closed.